Werner Aisslinger, born 1964 in Nördlingen, Germany. He studied industrial design at the Hochschule der Künste (HdK) in Berlin. Between 1989-92 he worked freelance for Ron Arad, Jasper Morrison and in the Studio... Read more de Lucchi in Milan. In 1993 he founded his own office, "studio aisslinger", with an emphasis on product design, design concepts and brand architecture. From 1994-97 he taught at the HdK and at the Lahti Design Institute, Helsinki, and from 1998-2005 as professor at the Hochschule for Gestaltung in Karlsruhe. Werner Aisslinger became project supervisor at the Designlabor Bremerhaven in 2006, and has served as a jury member and curator for the Raymond Loewy Foundation since 2006, when he was also named to the jury of the Lucky Strike Design Award. Aisslinger lives and works in Berlin. Level 34 is an office furniture system that offers excellent workstation solutions. 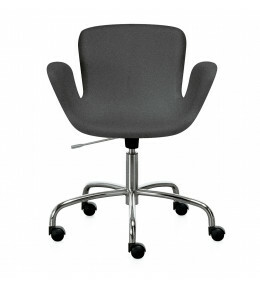 Juli 09 Chair is height adjustable informal seating; ideal for reception and office meeting rooms.